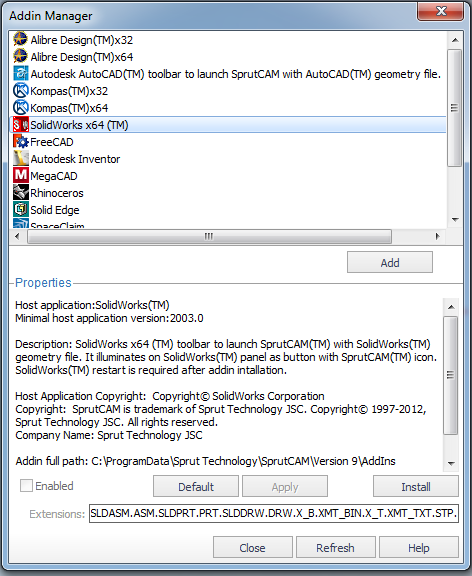 Toolbar to launch SprutCAM(TM) from SolidWorks(TM) with current project. This addin showed as button with SprutCAM icon. SolidWorks(TM) must be restarted after this addin is install. You can use <Addin for import SolidWorks(TM) project files ...> for import SolidWorks(TM) project files. File extensions SLDASM, ASM, SLDPRT, PRT, SLDDRW, DRW, X_B, XMT_BIN, X_T, XMT_TXT, STP, STEP are supported. Note: You must have SolidWorks(TM) installed on your computer before setup this addin and use import.